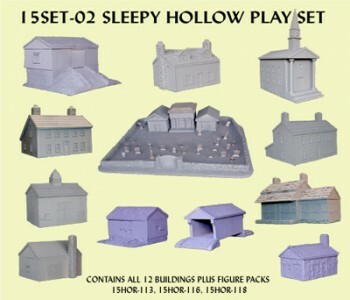 The Sleepy Hollow Play Set comes with all the Sleepy Hollow buildings plus figures so you have everything you need to set up your Sleepy Hollow Town. These buildings would work for many of your gaming scenarios also. The Sleepy Hollow Play Set sells for $430.00. If you purchased these buildings and figures individually they would sell for $473.00. If you are an Old Glory Army Card Member after discount your member price would be $258.00, that is a whopping savings of $215.00 for our Old Glory Army Members. The Sleepy Hollow Play Set can be purchased from either the www.bluemoonmanufacturing.com or the www.oldglory25s.com web sites.